Wing span: 7/8 - 1 1/2 inches (2.2 - 3.8 cm). Identification: Geographically variable. Upperside of male iridescent blue, female brown with orange submarginal spots. Below, hindwing has a thin black line along outer margin which is broken into small dots at vein ends. Can be positively identified only by dissection of male genitalia and by locality. Life history: Males patrol near host plants for females. Eggs are laid singly on stems of host plant or in debris beneath it. Second-stage caterpillars overwinter. Caterpillar hosts: Plants of the heath family (Ericaceae) in the east; legumes of the pea family (Fabaceae) in the west. Adult food: Nectar from flowers including yarrow; dogbane; orange hawkweed; and white, alsike, and hop clover. Habitat: Openings in mixed evergreen forests, bogs, wet meadows, seeps. Range: Holarctic. Nova Scotia west through the Great Lakes area and southern Canada; north to Alaska; south to central California, southern Idaho, and southwest Colorado. Conservation: Subspecies lotis is probably naturally rare with low population densities; it is found currently in only 1 out of 7 of its historic sites. Successional changes in vegetation due to human disturbance choked out the host plant Lotus formosissimus. Subspecies lotis has The Nature Conservancy rank of T1 - Critically imperiled because of extreme rarity (5 or fewer occurrences, or very few remaining individuals), or because of some factor of its biology making it especially vulnerable to extinction. (Critically endangered throughout its range). The species as a whole has The Nature Conservancy Global Rank of G5 - Demonstrably secure globally, though it may be quite rare in parts of its range, especially at the periphery. 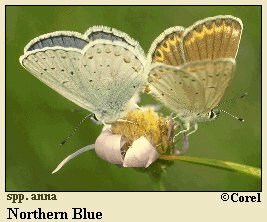 Management needs: The U. S. Fish and Wildlife Service recovery plan for the Lotis Blue cites the need for basic biological and ecological information about this butterfly. Three steps to recovery are listed: 1) protect remaining habitat and butterflies at the only known population site, 2) establish 3 new populations at different sites, and 3) determine the extent of the population and the size of secure habitats needed.